In the legal field, your people are your product. This makes your online profile or bio pages one of the most critical areas of your website. Our experience with legal website design has shown these pages often make up 30-50% of pageviews. To miss an opportunity to sell, convince or connect with a potential client once they land on these pages is a missed opportunity of the worst kind, as these visitors are often qualified inbound leads that are looking to explore a firm’s depth and experience on an individual level. Below, I’ve outlined a number of considerations and recommendations for creating the perfect bio page on your legal website — a seemingly simple exercise that can be drastically improved with the right attention to detail. It’s well-known that a visitor’s eyes are drawn to images. This is likely the first page element people will see and the impression it makes can be a lasting one. Make your headshots memorable, engaging and representative of your culture or brand. Consider your backdrop, your expression, your stance and the format (large /small, black and white / color). Don’t stand in front of a dusty bookcase in a suit and tie if you’re targeting progressive, young companies. Conversely, don’t tarnish your appearance with an overly relaxed or amateur photo that fails to capture your professionalism. Note: While there are exceptions, I would generally recommend using the same profile picture throughout all of your work-related online profiles. This creates consistency and familiarity throughout channels. Also, although less common, video is another effective visual communication tool with the similar considerations. Including contact information is a given, but don’t overlook how best to structure and offer that information, optimizing the experience for the visitor. For example, while vCards are less common in many industries, they’re quite prevalent in the legal space. Other steps to making information convenient and accessible includes linking your physical address link to an online map with directions and including actionable social networking links, such as connecting on LinkedIn or following on Twitter. Email addresses should also be functional mailto links and not pure text. Let the spam filters deal with any email scraping concerns. The convenience of a direct link outweighs the cost of missing an inquiry. Note: More information on structuring contact information as it relates to SEO is below. Interactions and connections happen outside of your website. Your bio page should be a landing page or microsite for an individual’s professional practice – a hub from which other interactions can occur. I recommend linking to your (updated) LinkedIn profile and possibly a Twitter account if you use it regularly for business purposes, such as updates related to professional events you’re attending or if you participate in industry-related conversations online. Also, following or promoting the achievements or clients and colleagues. While it’s not reasonable or even appropriate to update your bio page with the same day-to-day information that would go into your Twitter feed, incorporating these channels creates a deeper and more personal online profile, one with greater reach and more personalized options for staying in touch, which lead to real life connections even business deals. Social media for law firms is a widely discussed topic, but for the purpose of this post, I would also mention that it rarely makes sense to include social network links that have an overly personal focus, such as Facebook. Niche networks, however, such as Martindale, are certainly worth including if you’re paying for inclusion in that service and have established a favorable peer review ranking. Google Plus could also be considered. Ultimately, it comes down to how (or if) you utilize these social services. With so much care put into your profile, you want to make sure that it’s a top result for your name in search results. This is also a key component of online brand management. For every search result that you aren’t actively optimizing, another result will appear in its place. As an SEO baseline, make sure that the attorney’s name is the H1 tag on your page along with using the person’s name in the page title, meta description and URL. Including keywords and properly formatted links with relevant anchor text is also worth considering, especially as it relates to linking within the site to pages such as practice areas. Within the code of the page, use microdata formats to further refine the information you’re providing. This simple step will help to provide meaning to your data, defining names, titles and contact information. 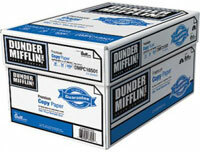 With only a handful of law firm accounts, Dunder Mifflin could thrive for many years. Create a simple print stylesheet for your profile pages, structuring the information in a print-friendly format that ideally fits on a single 8.5 x 11 page. Hide information such as navigation links and supporting information that often exists in a sidebar. Also, account for information that is hidden on screen, such as tabs or accordion layouts. If a full mobile strategy is not in place, consider a stand-alone approach for your bio pages. A simple mobile stylesheet, similar to print, can help to optimize the mobile experience, making it easier for a client to quickly find contact information through their phone. Including published resources within your bio serves a number of purposes. It keeps the content fresh, it helps to position thought leadership and it’s the simplest form of content repurposing if the firm is already producing these materials for other areas on the site. This type of publishing usually includes articles, blog posts, news items, recent deals/transactions/matters and often speeches or presentations. Whatever form they take, have your site set up to easily integrate this information within your profiles, making it easy for your content manager or web team to attribute these items to an attorney (or several). Note: Not all attorneys in your firm will have the same publishing schedules or needs. Based on their individual experience and areas of practice, it’s common that the type and quantity of content produced is very different. Leaving these sections blank could unnecessarily present a particular person as inactive. Instead, build in rules and exceptions within your layouts that account for specific needs. Just as your photos reflect your firm’s culture, so too should your written tone. Referring to an attorney by first name or by a more formal surname both assist in framing the culture of the firm and therefore a potential client relationship. Regardless of your approach, consistency is important. Choose an approach based on the persona of your target client and reinforce that position throughout the profile. I've covered a lot of information here, but I'm sure I've overlooked other considerations legal marketers have encountered. What are your best tips for optimizing a legal bio page? I hope you'll share them with other readers in the comments below.